Can we get The Festival / 15 Years Anniversary added as a new art expansion under profiles. I own it as a stand alone shrink wrapped expansion for the new art. Can the 6th expansion in the new art Count, King&Consorts be added to the profile summary? And with the Big Box 2017, should the mini's get their own listing in the new art? Or do we wait until they are available on their own? I'll look into this shortly if no one else has. We only list products that has been released. The minis in new art may not be available at all as far as we know. Or that they will be announced officially. Doing a major overhaul in the profile fields as we speak, case things looks Catapulted. A complete overhaul in the profile field collection has been made (for the old art only for now). Added coherent titles and descriptions. Added Müller edition and, uhm, another field that I already forgot which one. Missing and will be added: The Cult. If you know other releases / versions that you feel needs a separate field, let us know. I have a few suggestions or. questions concerning the titels, because e.g. I find it a little bit confusing that not all expansion have been translated. e.g: Cathedrals in Germany vs. Burgen in Deutschland instead of Monasteries in Germany. Good suggestions, BigBoss. I have a few corrections/comments and will add a couple more suggestions. According to my research, this one has two official German names — Klöster in Deutschland and Die Klöster — and the official English names, according to Cundco, are structured as "German X" rather than "X in Germany." This also makes more sense in the context of the game, because it is certainly not a "Structure in Germany" — it is a German Structure in France. Mage & Witch is the only Mini that's not plural in English, so Mini-expansion 6: The Robbers should have that "s" added. The following would all make more sense to me if the name of the expansion came first. Just thinking about this pragmatically, nobody is going to look these up by issue number. 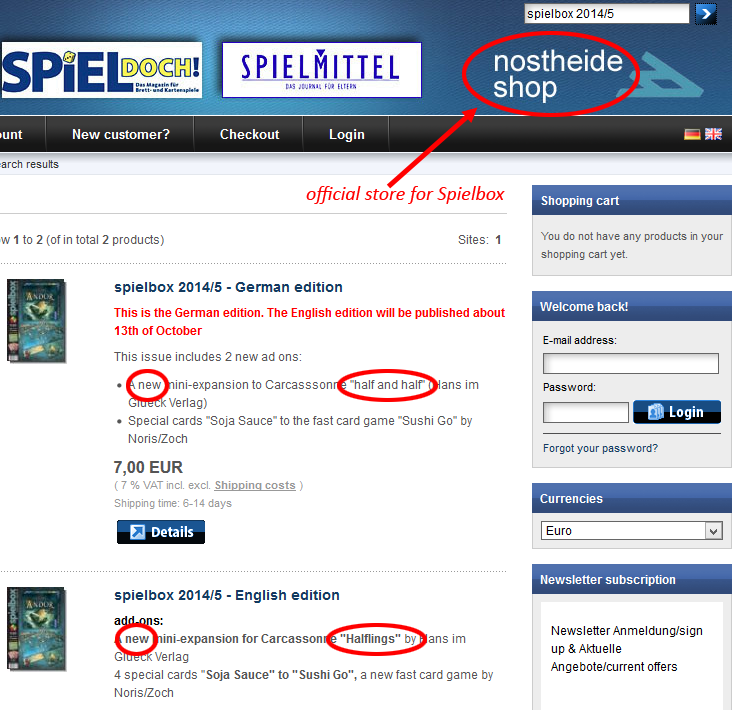 Also, for what it's worth, nostheide.de uses slashes rather than dashes. The official name of the GQ#11 thing is The Mini Expansion. To be consistent wth the other magazine releases, I would recommend labeling it like this: The Mini Expansion (Games Quarterly #11). The new profile layout is based on information found on Cundco.de, HiG and BGG and synced with these to make things less confusing using correct spelling etc. The CAR has had very little hand in this as it will be updated eventually and hopefully adapts as well. Titles are taken from actual English boxes and then German and so forth if English does not exist. The errata mentioned I'll look into shortly. I think that's great!!! THANKS! It isn´t really easy to find correct names because between CundCo, HiG, SpielBox & the official Rules, there isn´t a real consensus regarding the names of the expansions. Die Labyrinthe von Carcassonne: SpielBox/SpielDoch! 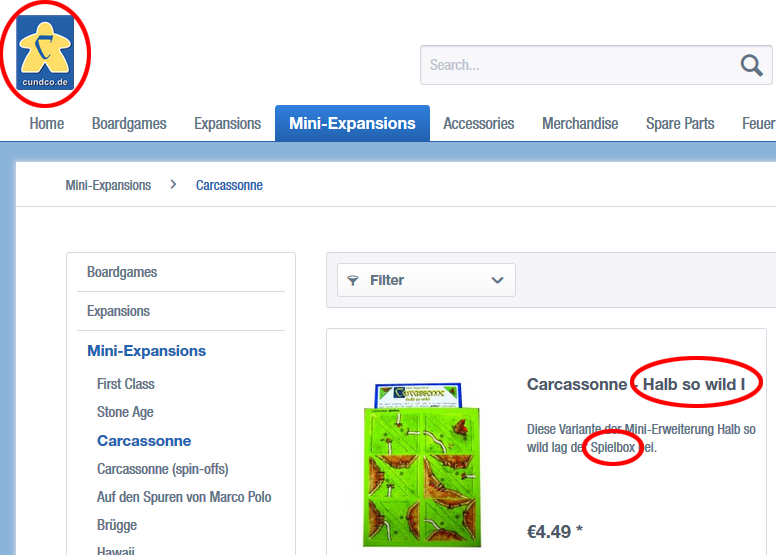 It is called on BGG: The Mini Expansion, but in the magazine it is only mentioned on the cover as: "12 new carcassonne game tiles inside"
I'll look into adding the variation names. The title is limited to about 40 characters, hence the "Exp" only instead of Expansion. In that case, I would recommend abbreviating all of them in the same way. Yes, I'm certain. I research almost everything before I post. Thanks fo the info & the good research about "Halb so wild"